This artist rendition of the proposed putting green at Moore County Airport shows the plantings and bunkers which will replace the brown and barren traffic circle, which currently greets visitors to the airport. In a simple ceremony on a damp and gray Monday morning, the Moore County Airport broke ground on a world-class putting green to be installed in front of the terminal building. The green is being built on behalf of the airport by Pinehurst PPF, a local nonprofit organization. The green will be seen and used by passengers traveling through the airport, visiting pilots, and the thousands of other visitors who come to the airport every year. 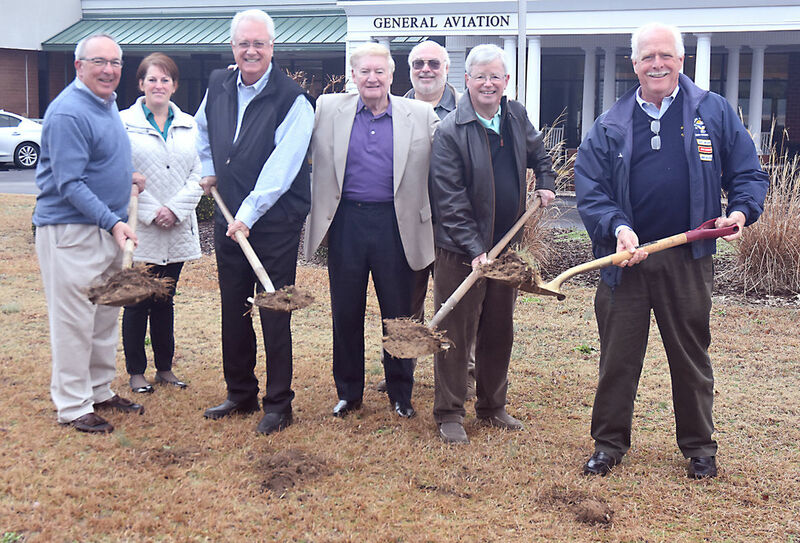 The ground-breaking ceremony at the Moore County Airport on February 19th included (l-r) Barry Lerman, Crystal Myers, Airport Manager Ron Maness, Marty McKenzie of Pinehurst PPF, Bobby Cox, Dan Maples and Mike Jones. The total cost for the project is estimated to be $80,000. The entire project will be funded from private donations; no public money will be used. While a substantial portion of the required monies have been raised, further donations still are being solicited. Interim construction loan financing has been arranged by Pinehurst PPF while fundraising continues. A small plaque in the terminal building will explain the purpose of the putting green and memorialize the donors. Pinehurst PPF was formed in 2017 by local citizens. The goal of the organization is to develop community projects that enhance the attractiveness of the region and emphasize the history and traditions of the area. The putting green is the organization’s first project. McKenzie is pleased with the fundraising progress to date. The low-maintenance putting green will be built on a large but weed-filled traffic circle in front of the terminal building. The design is intended as homage to Old Tom Morris and Donald Ross. There will be a hilly, Scottish-style putting surface and deep pot bunkers. The area will be lined with junipers, which resemble Scottish gorse but can survive the heat of the North Carolina summers. The flagpoles currently in front of the terminal building will be relocated to the Soldiers’ and Sailors’ monument at the airport and illuminated at night. Golf balls and putters will be available to visitors. Construction is expected to take six to eight weeks. 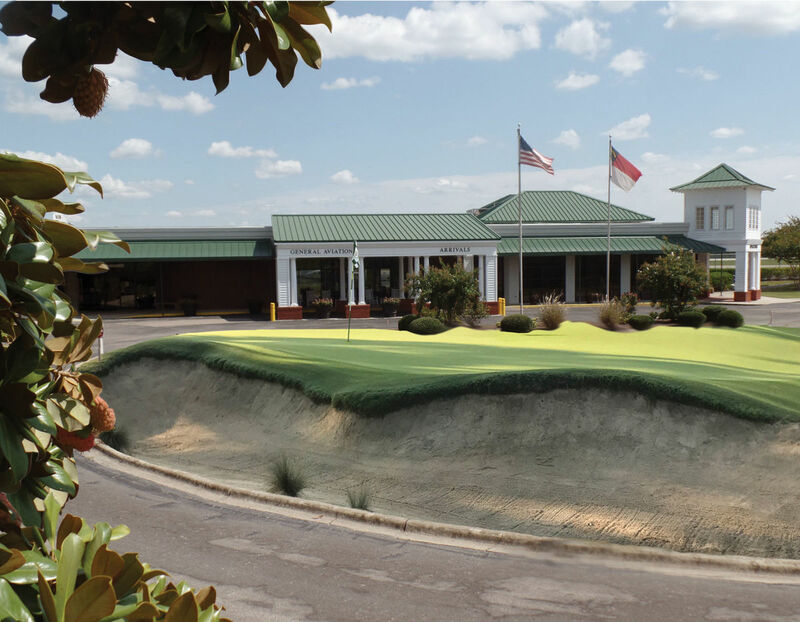 Aviation and golf both have long and parallel histories in North Carolina. Bostonian James Tufts basically invented the modern golf industry in America when he bought 5,800 acres in the Sandhills and laid out the first course here in 1897/98. The soon-to-be famous Donald Ross, who served an apprenticeship with Old Tom Morris in St Andrews, arrived as the golf professional at Pinehurst in 1900. Dan Maples’ grandfather, Frank Maples, worked with Donald Ross as his construction superintendent on the courses at Pinehurst, Mid Pines, Pine Needles, Southern Pines and Roaring Gap. While Ross was digging bunkers at Pinehurst, 250 miles to the east another revolution began. In 1903 the Wright Brothers made their first powered, heavier-than-air flight at Kill Devil Hills on the Outer Banks. This event is the reason aviation is featured on the North Carolina license plates. Today, aviation supports about $4 billion in economic output in North Carolina, including an estimated 23,000 high-paying jobs. Moore County Airport, which is labeled “Pinehurst” on certain aviation charts, was built in 1929. It served as an Army training airfield during World War II. Numerous celebrities have used the airport, including Amelia Earhart. Peggy Kirk Bell, one of the pioneers of the LPGA, used the airport and was the first professional golfer of either gender to pilot a plane to tournaments. Today the airport is home to about 100 airplanes and more than a dozen businesses. The state of North Carolina estimates Moore County Airport adds about $30 million annually into the economy of the Sandhills. Today the airport offers a 6,500-foot runway and parking for more than 50 airplanes, and is equipped with state-of-the-art instrument approaches and lighting. There are about 90 hangars and a flight school. About 6,000 planes land or depart from the airport annually, and the Visitor and Convention Bureau estimates the airport is responsible for a small but highly profitable portion of the region’s hotel room traffic every year. Looking to the future, the airport has an eye on improvements. A large portion of the parking area for airplanes is almost 50 years old. This needs to be replaced before the U.S. Open returns to Pinehurst in 2024 because it cannot support the weight of modern corporate jets. Within the next 10 years the runway will need to be resurfaced. The runway lighting is reaching the end of its service life, and new, LED-based lighting offers substantial operational savings and environmental benefits. All of these upgrades will be needed to maintain the airport and sustain its contribution to the regional economy.